We had cleared out of St Lucia on 3rd February for an early departure south on Saturday morning and actually made it out of the marina by 7am. The wind was light but then by 10am it picked up to a lovely force 4 out of the east – Askari was flying along at 8 knots and before we knew it we had left St Lucia behind and were fast approaching St Vincent. 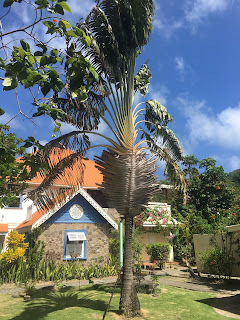 We had decided we would skip St Vincent, due to reports of theft from yachts, however it looked like a beautiful island covered in woodlands with high peaks. We did call the marina at Blue Lagoon for tidal information and they confirmed our thoughts that we couldn’t enter and they were full anyhow. So we sailed on and then had a big debate as our original plan was to sail to Grenada and then work our way back to the Grenadines; but it was about 4pm as we reached Bequia perfect timing to anchor up for the night, so we headed in. All day we had been making on a boat called Queen Emma we could see on AIS, as we approached her she looked very familiar – an Oyster 45 sailing beautifully. We grabbed the camera and got some nice shots and she did the same with big waves – we later heard their daughter is called Emma and she is the Queen of their household! We anchored safely in Bequia, with Twilight Oyster 125 across the bay, and Queen Emma behind us. Then just before the glorious sunset we were joined by Oyster 725 Dama de Noche – yes it felt like we were in Oyster land!! 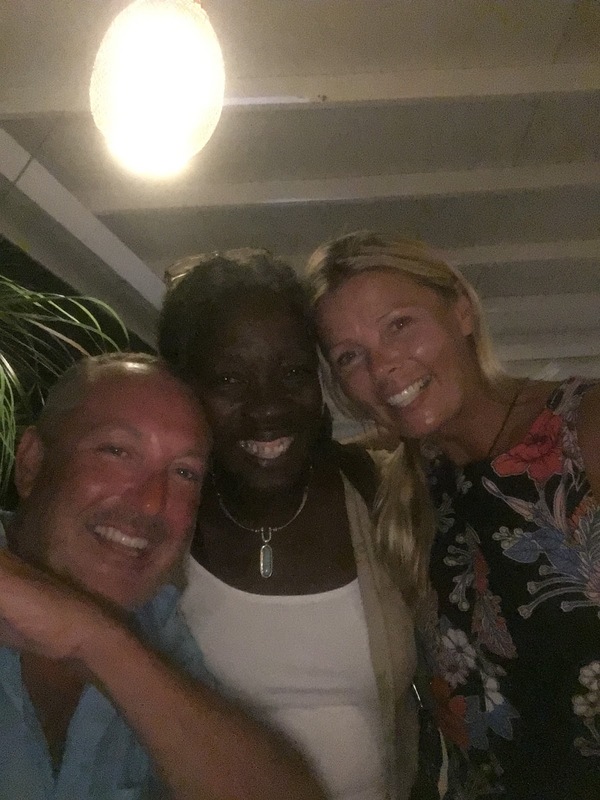 When we sailed across the Atlantic last time in radio contact with good friends Hugh and Heather, Heather talked so often of Bequia and how much she loved it so finally being in her favourite place in the Caribbean felt quite familiar. We quickly saw the daffodil laundry, water and diesel boat, met some of the colourful boat boys, went ashore to find a great bakery, bookshop and delightful local arts and crafts. Oh yes we instantly decided we liked it very much. We did get caught out though….. on our final day in Rodney Bay we met a gorgeous kiwi couple who had bought a boat in Bequia and were looking for a lift down. We thought we couldn’t help, so asked Jonathan on Aqualuna if he knew anyone; then he suggested they go with them the next day from Marigot Bay. We did feel a bit guilty when we all met clearing into Bequia – a few laughs and a plan to have dinner that night at Jack’s after sun downers on Aqualuna, the stunning Discovery 58. We ended up spending a week in Bequia and really got to enjoy the vibe of the place, people are very friendly and the yacht services are brilliant. I got my new paddle board out and went on some adventures around the bay, we did two nice walks – one to Friendship Bay and another to Spring. On the way to Friendship Bay we passed by the Diamond Bar and decided to go back for lunch – there we met Michael who was a Czech guy who had sailed into the Bequia over 10 years ago; he spoke English like a Bequian and had heaps of good stories. We had a great discussion about whaling – Bequia has a IWC quota to kill four whales a year, on the basis that it is ‘aboriginal’ whaling and done using traditional methods with a sail boat. However, we learned that actually whaling was actually started by Euopean settlers and speedboats are now used to assist the sailing boat. However, the Bequians do not often catch even one whale and a famous whaler pulled out of the activity in 2013, favouring ‘whale watching’ after learning about it in Australia, and since that they have only caught one. The Bequian’s are proud of their whaling history and whales feature in lots of local art and logos however the IWC quota is up for review in 2018. Let’s hope whale watching really takes off in the island. In Spring we saw stunning villas being built, met really friendly people walking along and stopped in for a cold drink at the stunning Sugar Reef Café – right on the beach. Definitely a spot I would like to come back to for lunch. Our last night in Bequia was Fish Friday at the Fig Tree –we had been into the Fig Tree restaurant a few times to use wifi and have a drink, we met the fabulous Cheryl who convinced us to book in for Friday. What fun, love music, fabulous local seafood and her lovely staff who got everyone dancing after a few rum punches! !